From Goodreads. Before Peter Pan belonged to Wendy, he belonged to the girl with the crow feather in her hair. . . . Fifteen-year-old Tiger Lily doesn't believe in love stories or happy endings. Then she meets the alluring teenage Peter Pan in the forbidden woods of Neverland and immediately falls under his spell. Peter is unlike anyone she's ever known. Impetuous and brave, he both scares and enthralls her. As the leader of the Lost Boys, the most fearsome of Neverland's inhabitants, Peter is an unthinkable match for Tiger Lily. Soon, she is risking everything—her family, her future—to be with him. When she is faced with marriage to a terrible man in her own tribe, she must choose between the life she's always known and running away to an uncertain future with Peter. With enemies threatening to tear them apart, the lovers seem doomed. But it's the arrival of Wendy Darling, an English girl who's everything Tiger Lily is not, that leads Tiger Lily to discover that the most dangerous enemies can live inside even the most loyal and loving heart. From the New York Times bestselling author of Peaches comes a magical and bewitching story of the romance between a fearless heroine and the boy who wouldn't grow up. I wanted to write this review while the book was fresh in my mind. I’ve seen the rave reviews and 5 star ratings for this one and while I liked it; it wasn’t a favorite of mine. I have so many thoughts about this one! First and foremost if you’re looking for a cute sweet fairy tale this is not it! It is a fairy tale and, we all know the story of Peter Pan and we like to think that means happy thoughts right? Well in my case there were no happy thoughts; this book ripped my heart out and made me hate Peter Pan and Wendy Darling with a vehemence I didn’t think was possible. Also the title and synopsis may be about Tiger Lily (whom I didn’t like much either but felt for her) but this book was told from Tinker Bell’s POV and therefore I feel this was more Tink’s story than anyone’s. I loved Tink she was my favorite character in the whole entire book! There were a few characters that I really did like as well. I adored Nibs (one of the lost boys) and Pine Sap (one of Tiger Lily’s friends from her tribe) and believe it or not I liked Hook. Yep Captain James Hook he was a bad dude but he was honorable and I really respected him for that. The story starts pretty slow but, you’re quickly swept into Neverland and sometimes you almost wish you could escape because of the heartbreak and pain. Also Tiger Lily’s awkwardness and Peter’s blatant refusal to accept facts made it hard to root for either of them. Like I said I rooted for Tink the whole time. If you love Neverland stories I suggest giving it a try. I chose a passage from Tink because well quite frankly her thoughts made me feel the most emotion. I confess. I flew back to the burrow on secret, nightly visits. I watched Peter and the boys. I nestled behind Peter’s ear one night while he slept. I lay on his chest and listened to him breathe. I wanted to be close to him and smell him and hear his heartbeat. I watched the lost boys living without a girl in sight. I watched how they existed hand to mouth, from one kill to the next. And how they wondered what else there was out there to see and to do and what was missing. Next to Tiger Lily, Peter was the loneliest person I’d ever set eyes on. But mostly, I saw something they wouldn’t let anyone else see. How scared they were, and how well they hid. And I knew, too, what they hid from, and how much they should fear. 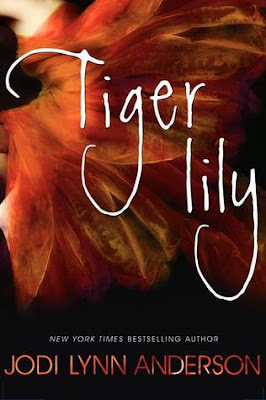 Add Tiger Lily to your Goodreads shelves. I was quite curious with this book. Wasn't sure what to make of it and honestly I didn't think of reading it at first but . . . I'm now intrigued. Great review! Thanks! Yeah I had a hard time with this one even though I liked it. I had not heard of this story until you mentioned it the other week on Twitter. I don't know that I'm a fan of Neverland stories, but I like the idea of the rip your heart out bit. I love hating characters and I was never a fan of Peter Pan in the first place. Grow up already Pete! You've definitely got me curious about this one. And the passage you picked has me even more intrigued. Think I may have to add this to my TBR. Thanks! I love that cover so much but I don't really think it's the book for me after reading a few similar reviews. Hmm sounds interesting but I'm not sure if I'll like it. If I'm going to hate Peter and Wendy I don't think I should read it, haha. "Peter’s blatant refusal to accept facts.." Yeah, THAT it's annoying for me. I love the cover though! Gorgeous!! Tiger Lily made me both happy and sad. This book opened my eyes in a way I didn't expect. I am a bit sad that I didn't read it before but I am glad I waited because now I can truly appreciate this book for what it is: A work of art that stole a piece of my heart.